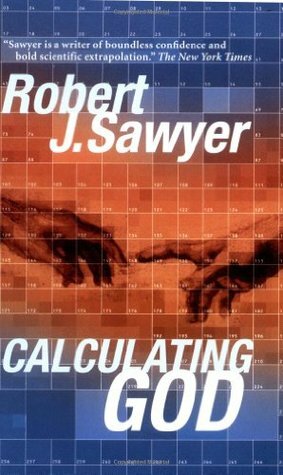 I decided to have a go with Calculating God by Robert J Sawyer because the notion of an outsider coming into our society and attempting to prove God’s presence was intriguing to me. I thought the book might offer me some interesting insights on one side of the debate or the other. I was wrong. The story is told from the perspective of Dr Tom Jericho, a palaeontologist at Toronto’s Royal Ontario Museum. An alien ship has come to earth with several members of two different life forms that have already found one another. One of those aliens spends most of their time with Tom doing research on the history of earth’s species.The central conflict of the story consists of Tom and the alien, Hollis’, constant debates about the existence of a creator; two extremely misguided bible thumping rednecks who are angry about abortion, evolution, and 70 million year old fossil preservation; and Tom attempting to reconcile his family to his terminal lung cancer diagnosis. For me, the only truly engaging part of the book was this last part. Dr Jericho, although in his fifties, had an adopted son who was only 5 years old, and a wife of ten years. The interactions amongst the three of them were sweet and touching. At one point the exchange between father and son brought a tear to my eye. But then, the rest of the book just grated on me. The God versus evolution dialogues made both sides look ridiculous. Tom talks about how he is staunchly an evolutionist, but freely admits that there is pretty much no actual known transitional vertebrae that show how one species got to the next; and how the whole idea of evolution is just as unproven as creationism. So, does Hollis’ arguments prove any more intelligent? In my opinion, not really. Most of them skew to a bizarre place what religion really looks like, and is also actually quite repetitive: alien says one thing, human says no; human says one thing, alien says no; alien says another very similar thing to the first thing, human says no. And around it goes. The one interesting creation argument that the book offered was about the idea of the atmosphere, gravity, minerals earth can support etc. are “designed purposefully and with great care, to give rise to life,” and that if any of these things were changed almost imperceptibly, life on earth would not exist. Food for thought right? And then, we have the redneck weirdos. They felt completely forced into the story, like they did not belong and were added in as an afterthought to provide an extra layer. In a really bad, obnoxious way. Not in a useful for conflict sort of way. These guys were just lame. And SO embarrassing for real Christians. They were NOT Christians. I think that is partially what bugged me about them so much, is that they were smearing the name of Christianity to such an extreme, fundamentalist, redneck, racist, completely out of touch with reality place that is was repulsive to me. This book has got me feeling annoyed. I wouldn’t recommend it to anyone who believes in God (or any higher power), nor to someone who believes in evolution, as I don’t feel wither side really made their point well. So you won’t get much fuel for your fire here, no matter where your philosophy lies. I think that covers everyone right? The 96% (don’t quote me) who believe in a creator, and the 4% who don’t. Just skip Calculating God. This entry was posted in Muse Reviews and tagged Aliens, Book Review, Creation, Evolution, God, muse reviews, Robert J Sawyer, Toronto’s Royal Ontario Museum. Bookmark the permalink. I always find it difficult when there are such obviously caricatured Christians in books, for exactly the same reasons–using the name of Jesus to spew hatred. I guess the thing is that, even though most Christians are not like that, the ones who are most vocal often do express those kinds of views. A difficult balance for the rest of us to strike–not to bible-bash at the bible-bashers, because that isn’t particularly loving either, but also not to allow that type of thing to go unchallenged. Very thoughtful review, thanks for sharing! Thank you so much for the encouragement and affirmation!